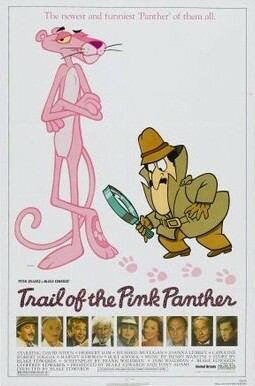 The Pink Panther diamond is stolen once again from Lugash and the authorities call in Chief Inspector Clouseau from France. His plane disappears en-route. This time, famous French TV reporter Marie Jouvet sets out to solve the mystery and starts to interview everybody connected to Clouseau. Each interviewee Dreyfus, Sir Charles & Lady Lytton (an ex-wife of Clouseau), George Lytton, Hercule Lajoy (assistant in "A Shot In The Dark"), and Cato tell of their run-ins with Clouseau. She is also kidnapped by mobster Bruno Langlois who doesn't want Clouseau found but she continues and finds Clouseau Sr., Clouseau's father.